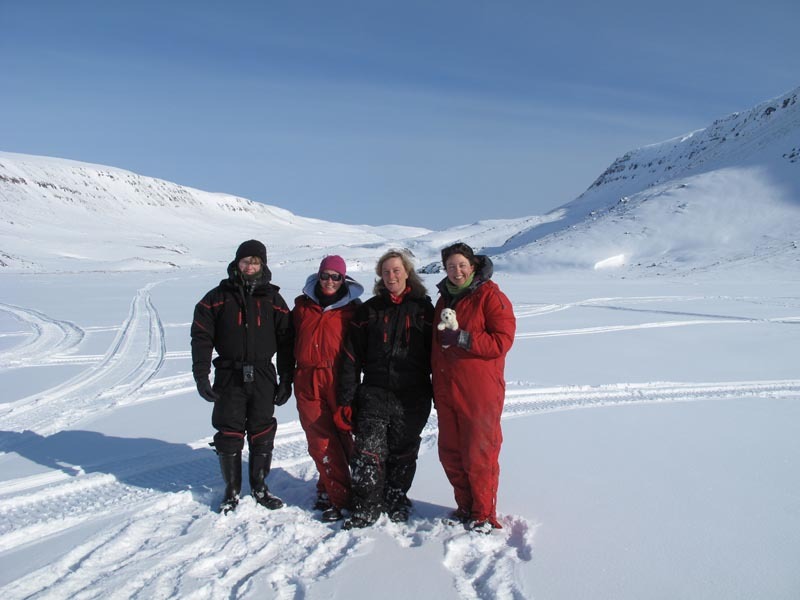 Having collected sediment cores and water samples from four lakes, as well as some catchment samples, our fieldwork on Disko Island has been successfully completed! 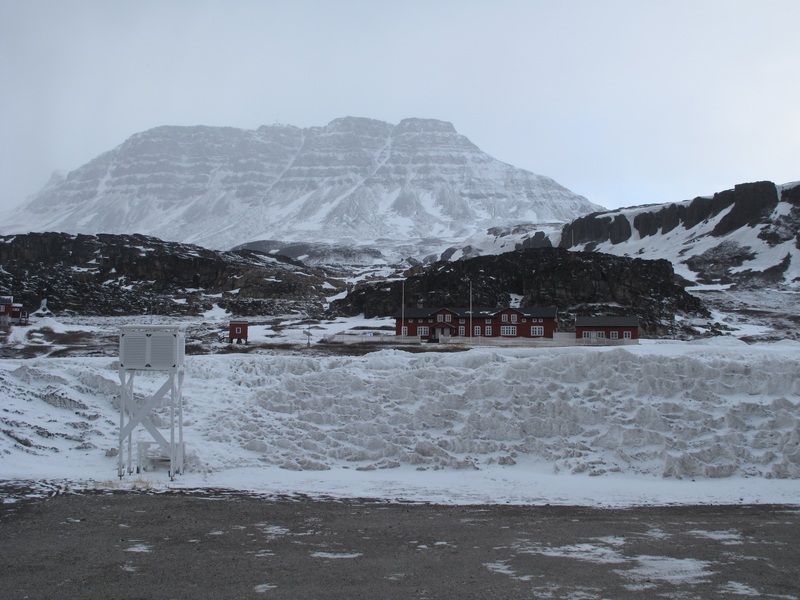 We were very lucky with the weather during our stay at the Arktisk Station which meant our fieldwork plan ran smoothly and to schedule (something that is not always possible when working in Arctic conditions!). 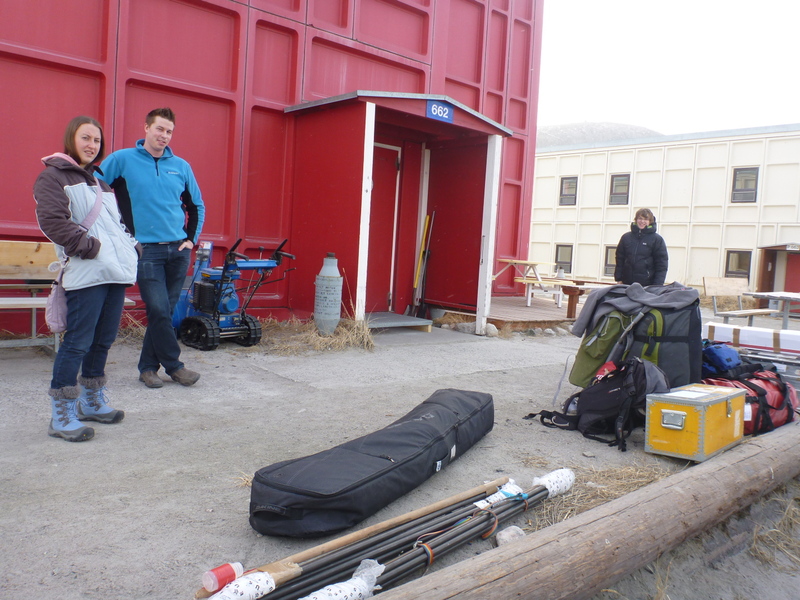 Having completed our sample collection, our final day was spent packing up our equipment to take back to Kangerlussuaq and packing up our samples for safe storage before shipment back to the UK in a few weeks’ time. 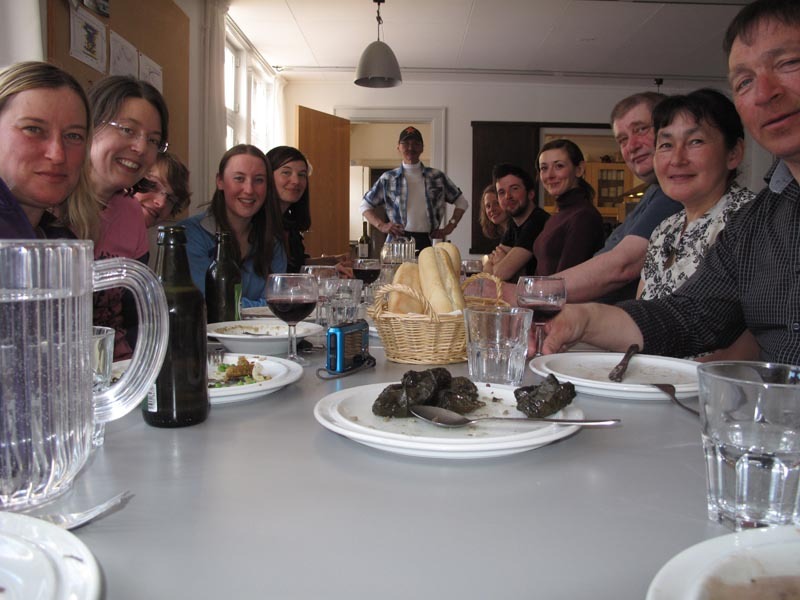 On our last evening the Station Leader, Ole, arranged a party for all the scientists which consisted of a huge five course feast which we all contributed to. We were careful not to over indulgence in the merriment as we had to check in at the heli-port at 5am the next morning! Farewell dinner party with Erik our snow-mobile guide at the end of the table. 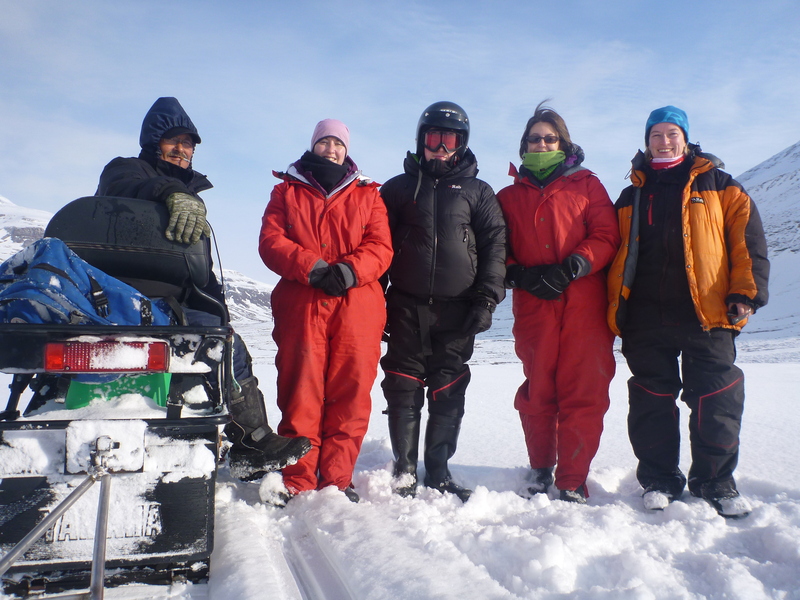 Team LAC-VEG is on the left and Akaaraq, our other snow-mobile guide, his wife and Ole are on the right. 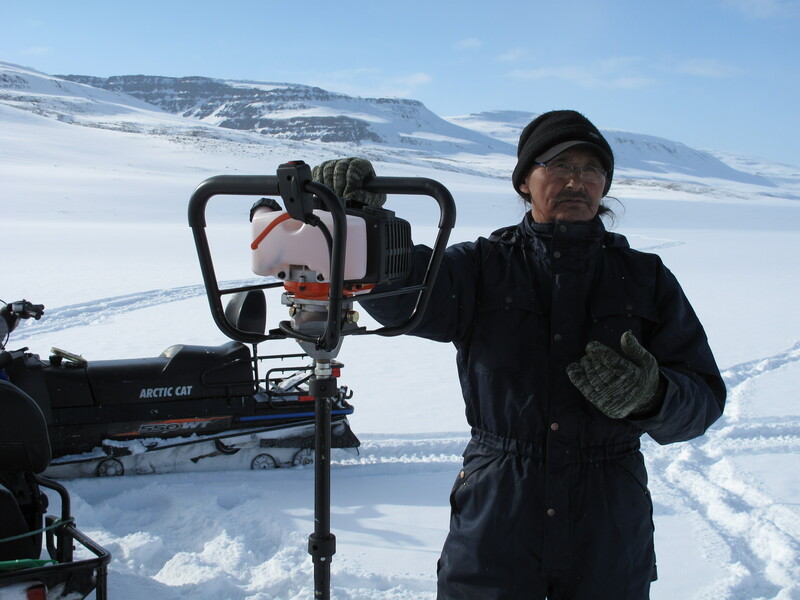 We would like to thank Ole, Erik and Akaaraq for their invaluable logistical help and support during our stay at Arktisk Station, and of course EU-INTERACT for our funding which made the LAC-VEG project fieldwork possible. As well as taking mud from the bottom of lakes, we have also been collecting water for chemical and biological analysis. Even under 1 m thick ice, there will still be algae present. When we return to the UK we hope to determine what species are able to grow under these extreme conditions. We have also taken soil and vegetation from the lake catchments. We hope that these samples will tell us about the type of nutrients which are likely to enter the lake and how this might influence water chemistry and biology. 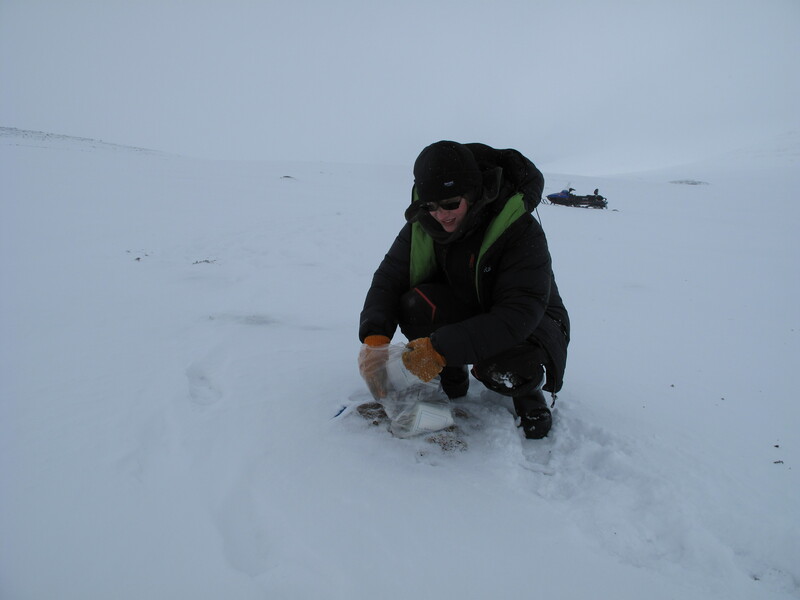 Here is Mark is collecting soil and vegetation samples. We are coming to the end of our stay at the Arctic Research station. We have had a really successful trip and managed to take Russian and short cores from 3 study lakes as well as taking a short core from a glacier-fed lake (just for fun!). 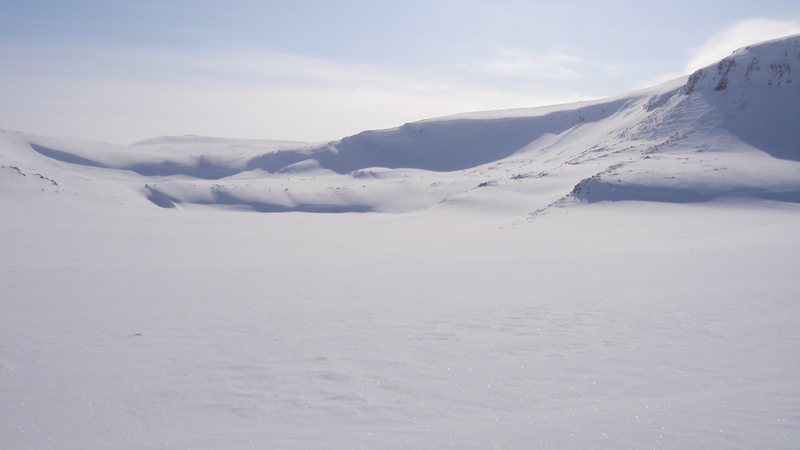 Disko 1 is a very shallow lake just 5 m deep situated in the middle of Blaesedalen valley. It took quite a while to locate this lake as the valley floor is very flat. 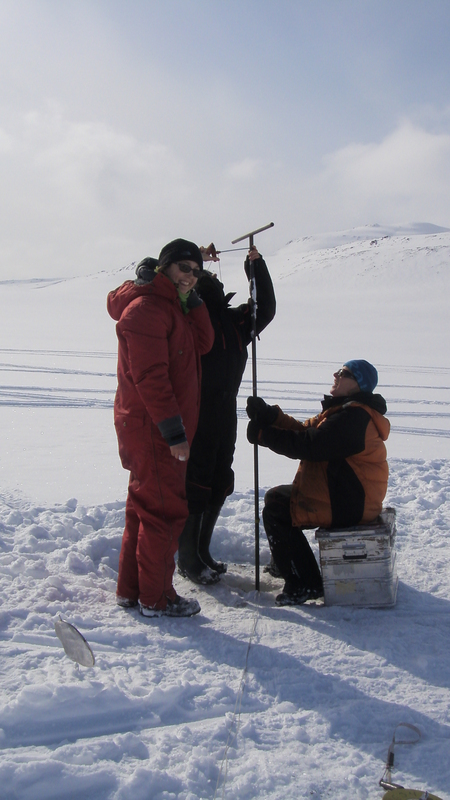 After clearing snow and drilling through the ice several times, we located our sampling point. Here we are walking transects across the lake to drill holes to locate the maximum water depth. On our first field day the weather closed in very quickly, so sampling Disko 1 took us 2 days. Luckily, the weather improved on day 2! Our second lake (Disko 2) is a beautiful lake situated in a small cirque. Again the weather was very kind to us when we sampled, with clear skies and very little wind. We recorded a maximum depth of 10 m and took replicate Russian cores and a short core 35 cm long. Disko 3 was the ‘fun lake’ which is glacier-fed. 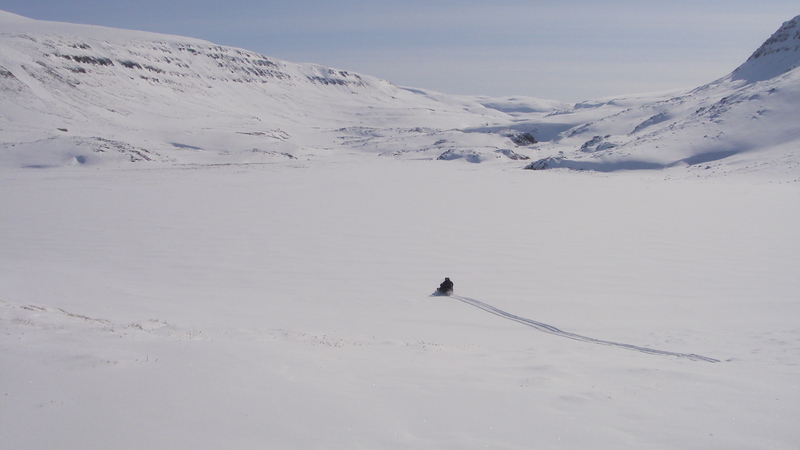 We had to travel by ski-doo across the Lyngmarksbraeen glacier to get to this lake, which is situated at 525 m above sea level. Disko 3 is the deepest lake we sampled at 29 m. We took a short core which was 43 cm long. We decided to sample this at 0.25 cm resolution, which took a while (numb fingers all round), but should hopefully give us some interesting results. 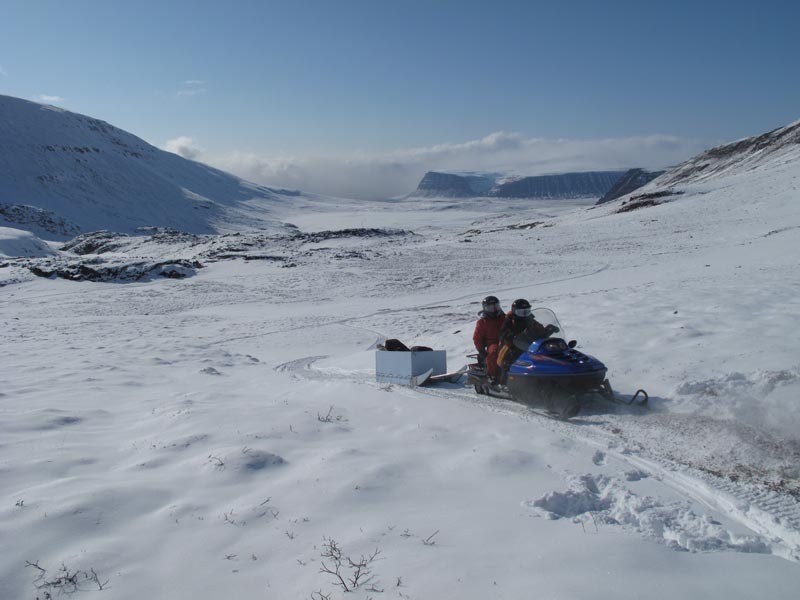 Disko 4 was also located on the other side of the Lyngmarksbraeen glacier and accessing this lake involved some advanced ski-doo driving. Here we are arriving at the lake after the bumpy 1.5 hour journey. We had lovely sunny weather for sampling, and took the Russian and short cores at a water depth of 7 m. We collected mud from 150 cm long sediment core. Having had such a successful trip we have plenty of mud to bring home to the UK and start analysing. 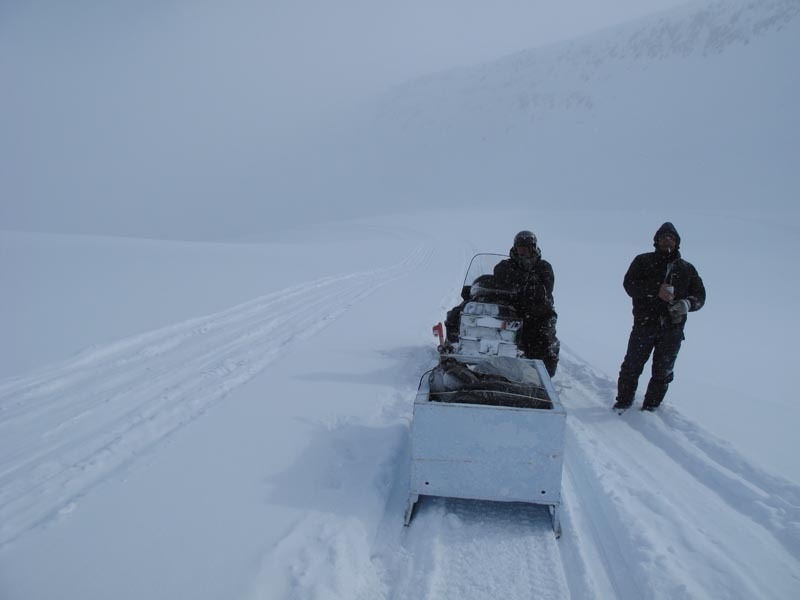 Despite the cold weather, we have taken successful Russian and short cores from 2 study lakes. Here we are taking a short core at our first study lake. The short cores are about 30 cm long and we have been sectioning them in the field. This can prove quite tricky and the equipment is prone to freezing. Luckily, flasks of hot water help resolve this issue! 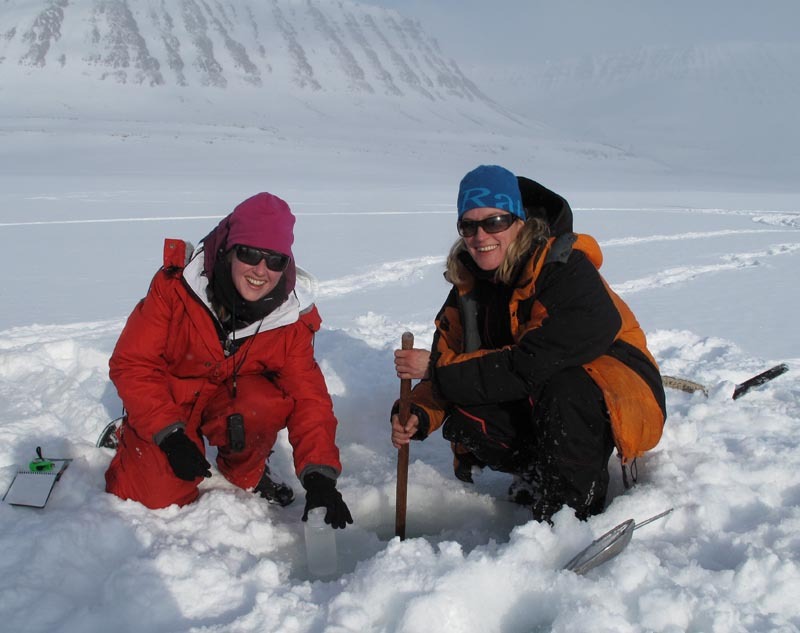 Here, Emma and Suzanne are getting ready to sample the core. 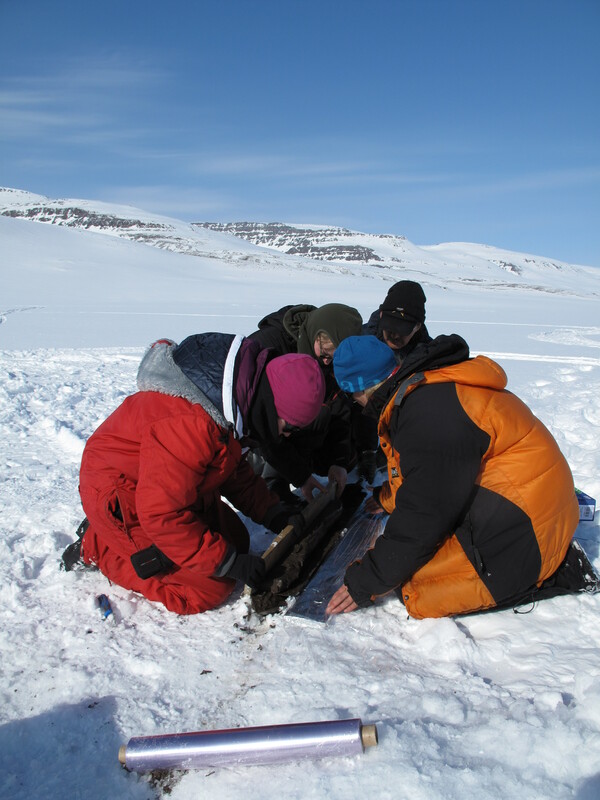 The Russian cores are about 150 cm and date back to when the area last deglaciated. 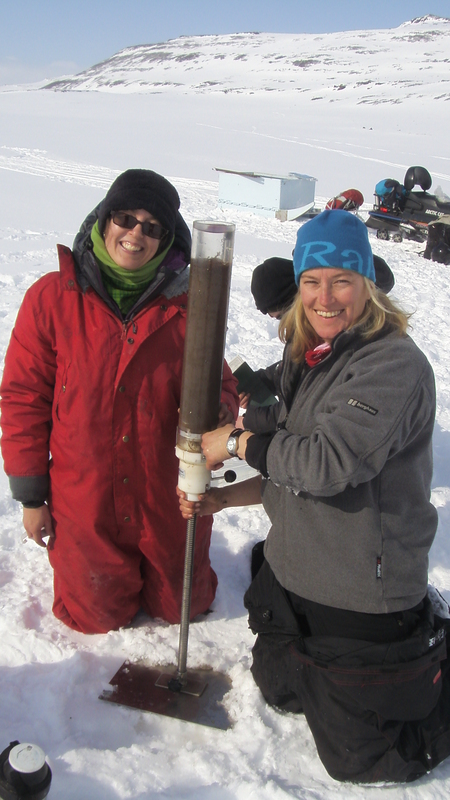 The corer is lowered down to the lake bed via a series of rods – the equipment is really heavy so you have to hold on really tight! Mark is tightening the rods to lower the corer into the lake. All hands on deck once the Russian cores are out of the lake. We have to carefully wrap the core ready to transport home. We haven’t had time to blog the past few days as we have had some long days in the field but we have completed the field work on two lakes, collecting Russian and short cores of what we hope will be full Holocene sediment sequences (more on that in a later post). One more lake to go! For now though, here are some of the highlights of Disko Island. From the windows at Artisk station (below) we can see icebergs and the airport (including the early morning helicopter departure to Aasiaat). 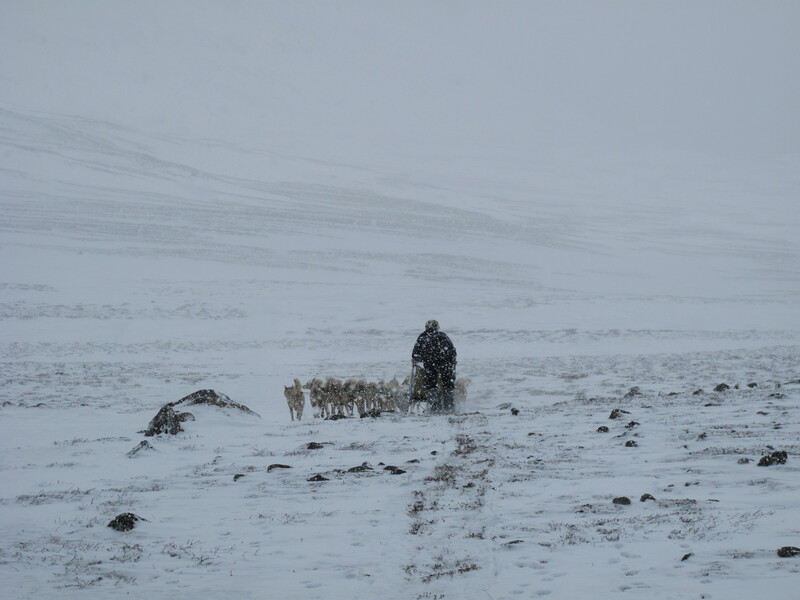 The weather by the station has been quite foggy , but our guide tells us that this usually indicates good weather in the mountains…..
…and this turned out to be the case. The weather has been cold (average -10 degrees C), but generally very clear and sunny, which has been fantastic for finding our way to the lakes using snowmobiles. There are beautiful basalt mountains with distinctive plateaus on the top. 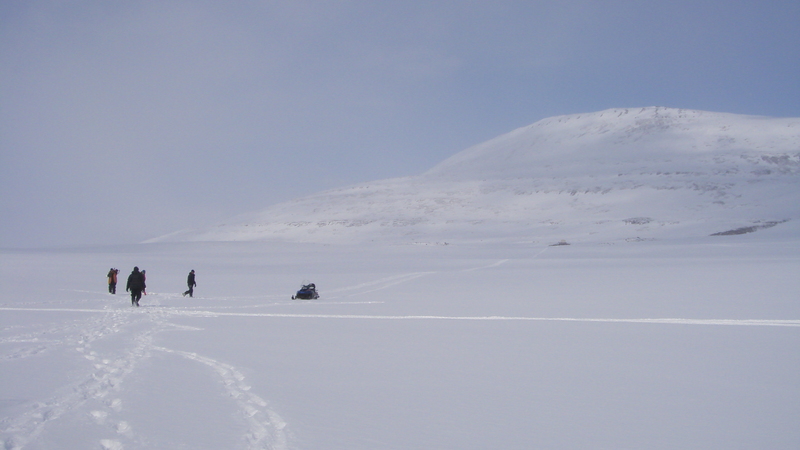 And a good set of snowmobile tracks, with Erik our guide showing us the way; it also turns out that Erik is pretty handy with an ice drill. More later on the coring that we have been doing. We had a fantastic helicopter flight across Disko Bay from Aasiaat to Qeqertarsuaq (Disko Island) where we will be staying at Arctic Station. 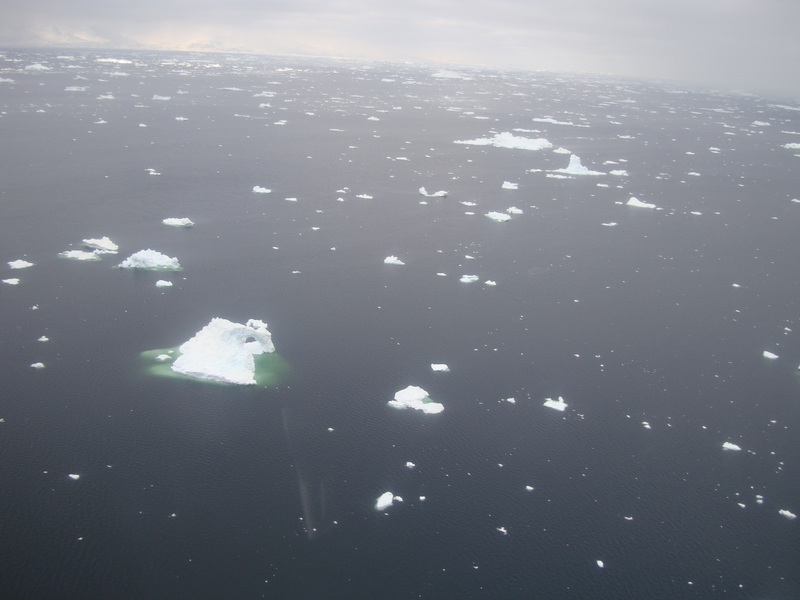 The icebergs were stunning and extended far into the horizon capturing the very essence of the Arctic. Here is our home for the next few days. 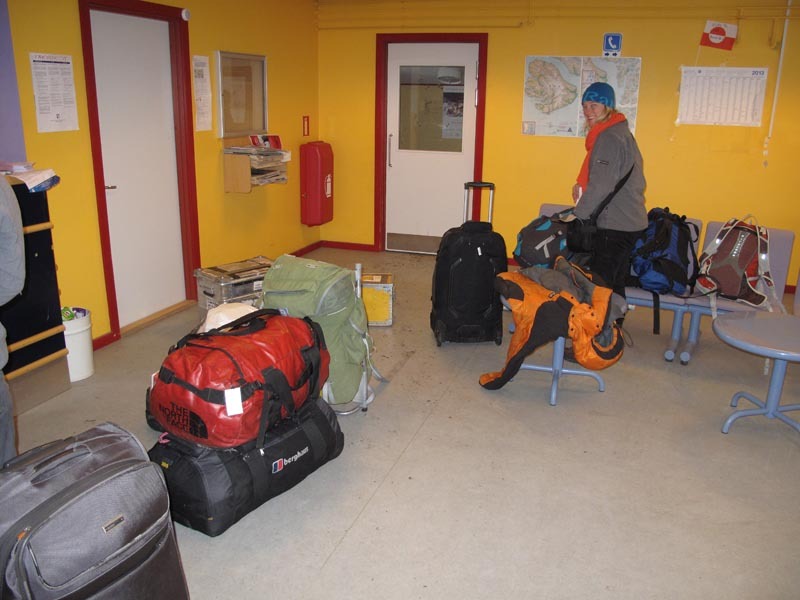 We arrived in Greenland yesterday morning and spent last night at Kangerlussuaq where we sorted through the field kit stored at Kangerlussuaq International Science Support, packing the ice drills and corer for the final leg of the journey. Only two flights (one small plane and one helicopter) for the final leg to Disko Island with eleven pieces of baggage (love Air Greenland)! Flight currently delayed due to bad weather so let’s hope we get there today. 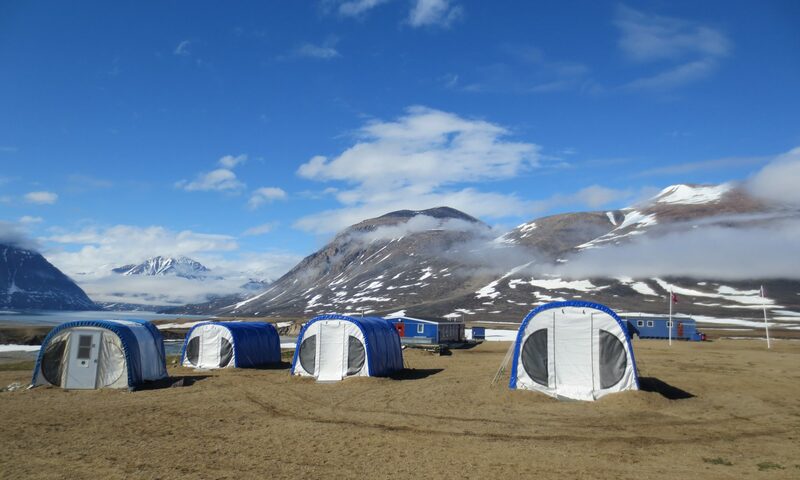 It is less than a week now before we arrive in Greenland to begin sediment coring on lakes at Disko Island in central west Greenland from our base, Arctic Station near Qeqertarsuaq. After months of planning we are finally beginning to realise that very soon we will be embarking on a scientific expedition to a remote destination that few people have visited. 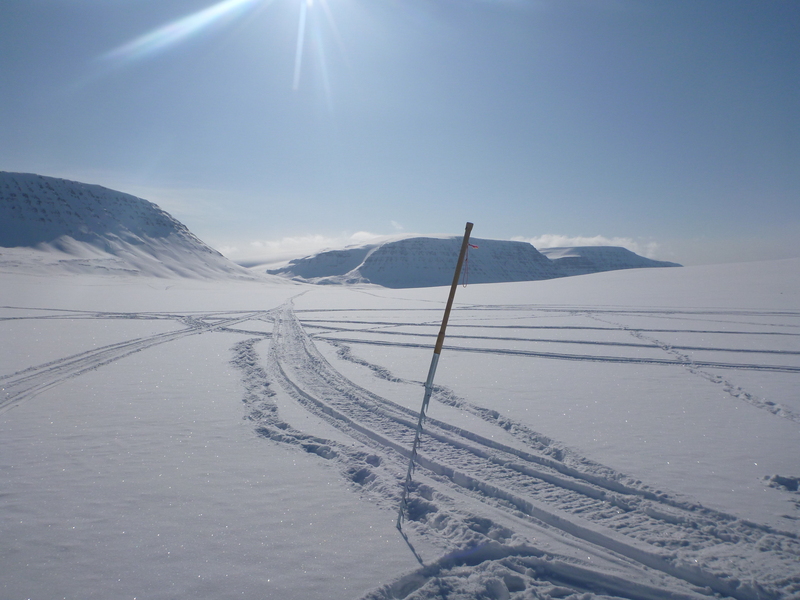 Our project aim is to collect sediment cores through the ice from two or three lakes on Disko Island to help reconstruct climate change in this region over a period known as the Holocene (~12,000 years). 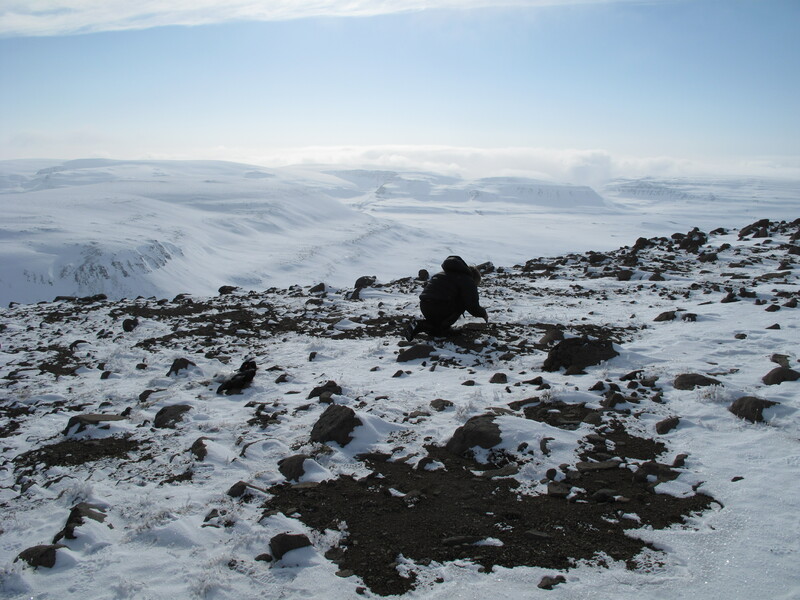 We chose Disko Island for our study as it is located above the Arctic Circle, but during the summer months has significant vegetation that has changed over time with past climate change. 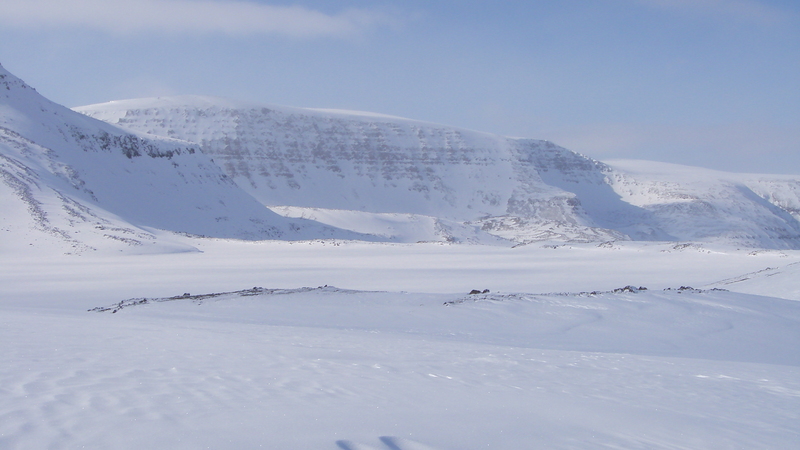 To our knowledge, few sediment cores from lakes have been taken from lakes on Disko Island. With climate in the Arctic now warming rapidly, vegetation coverage is expected to be expanding in a northerly direction – a process often called ‘greening’. But, it is not known what impact changes in vegetation may have on lakes and the storage of carbon in sediments. Lakes can store carbon in sediments or release carbon dioxide to the atmosphere; however only by looking at past changes in climate will we be able to better understand under which conditions lakes stored or released carbon. When catchment derived material enters lakes light can become limited, however it is unclear under which past climates this encouraged autotrophic production (carbon fixing by photosynthesis) or stimulated mixotrophic species (able to use carbon as a supplemental source of energy). When we take our sediment cores back to the lab we intend to run pigment and lipid analyses in order to reconstruct the land and lake communities present over the past ~12,000 years. Analysis of lipids are especially effective at distinguishing between land and lake source inputs, while pigment analyses have proven useful as they are excellent at inferring changes in aquatic biology. Two weeks ago three coring boxes constructed at Nottingham University complete with a box of supplies (including sediment bags, packing materials and sample boxes) were sent by air freight to Arctic Station on Disko Island. 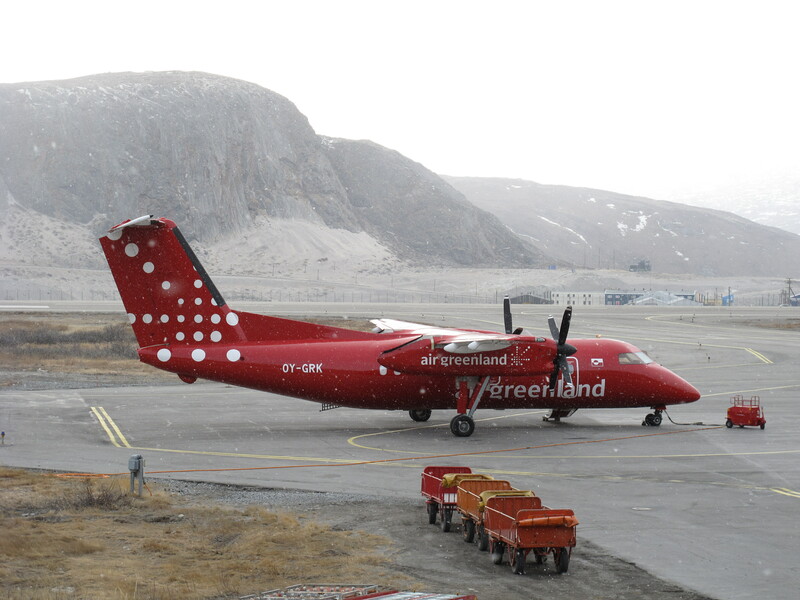 It is amazing to think that these packages may now be flying over the Norwegian or North Sea, the Greenland Ice Sheet or waiting in a storage facility in Kangerlussuaq before being loaded into a Dash 7 turboprop to Aasiaat prior to a 35 minute helicopter flight across Disko Bay to Qeqertarsuaq. Form where they might be forwarded by dog sleigh or Ski-Doo to Arctic Station! Let’s hope the boxes are not stuck with the couriers in Coventry! 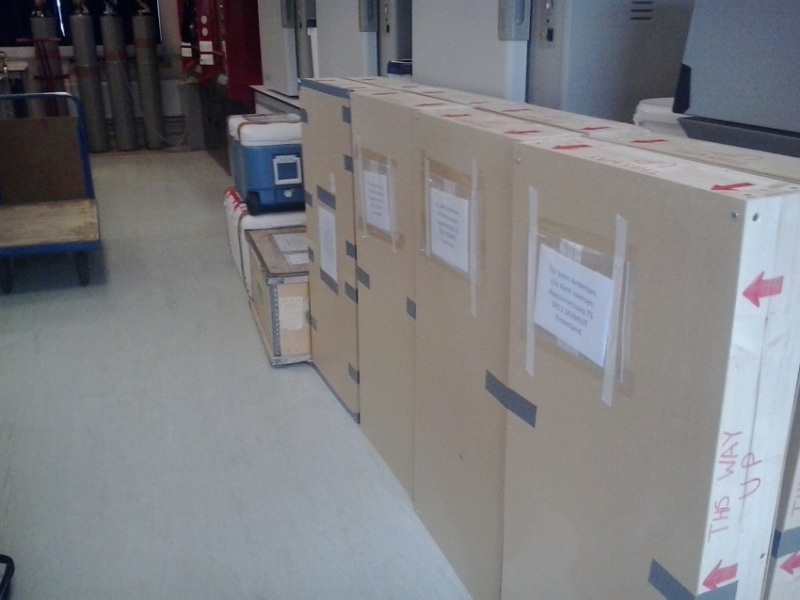 Some of the freight boxes sent by air freight to the Arctic Station in Qeqertarsuaq. Mark and Suzanne will meet Peter Rasmussen at the GEUS on Sunday to pick up the Russian Corer and Ice Borer and then check these in as excess luggage. 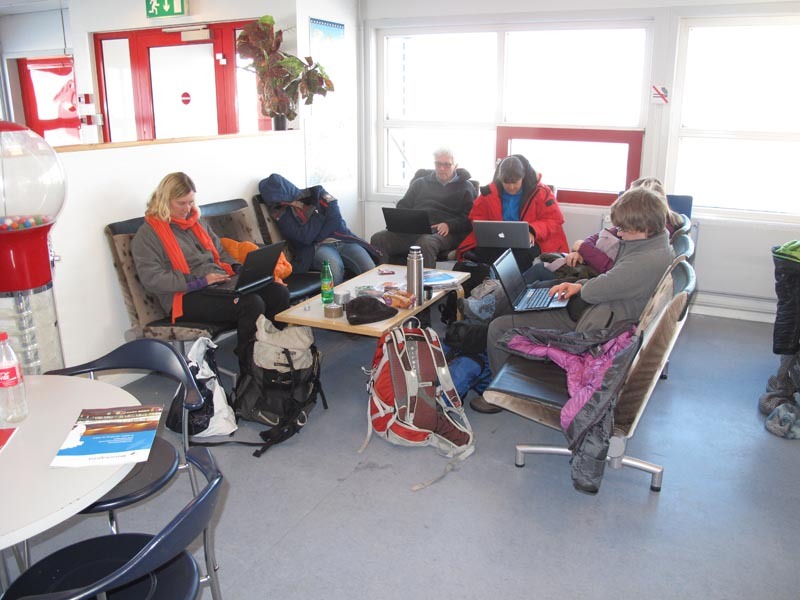 Then later in the evening we will meet up with Erika and Emma and on Monday morning fly from Copenhagen to Kangerlussaq. 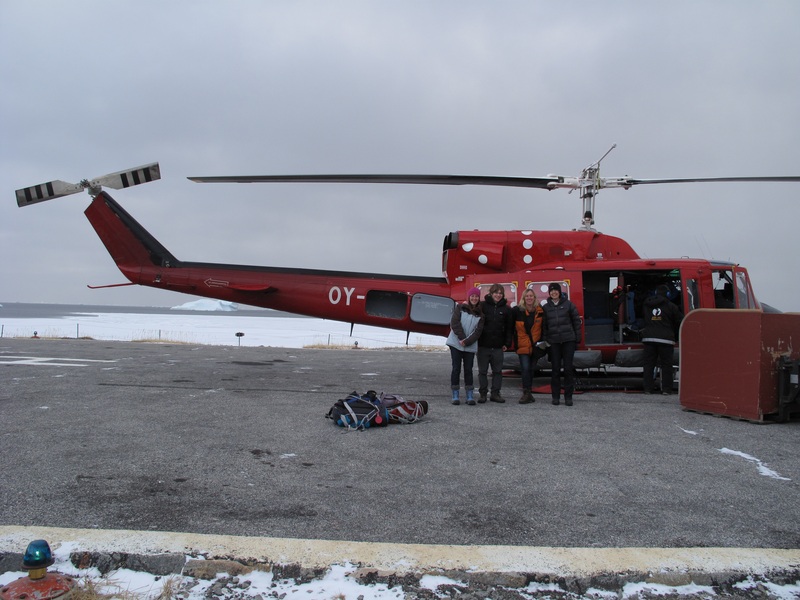 We will spend one day gathering supplies at the KISS (Kangerlussuaq Inernational Scientific Support) base in Kangerlussuaq before flying to Qeqertarsuaq via Aasiaat on Tuesday. Our plan is to use the first day to unpack the field kit, pick up the freight and meet the guides to plan our route, followed by days visiting the nearby lakes for sediment coring, packing and getting them ready to be sent back to the UK in one piece! We hope to keep the blog updated with our progress throughout our journey.